Gardai are warning motorists to drive with care. 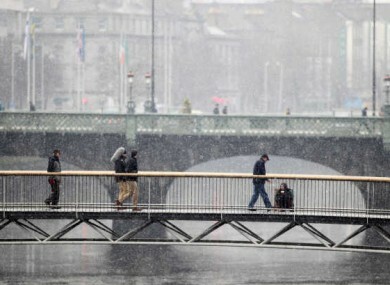 MET ÉIREANN IS forecasting further heavy showers overnight with strong and gusty winds. Frost will develop towards dawn with icy patches in places as temperatures fall to between 0 to 3 degrees Celsius. And it doesn’t get any better tomorrow. While the day will start sunny in many areas – showers will become widespread during the day. It’s looking particularly bad for the midland and western areas with hail, sleet and some snow showers forecast. Don’t lose all hope though, the forecaster added that “there is a possibility of milder weather returning next week”. Email “Hail, sleet and snow showers - the weather's not getting any better ”. Feedback on “Hail, sleet and snow showers - the weather's not getting any better ”.